Arrgh… He did it again. It’s 3 am, and that hairball your cat just deposited on the floor is right where you’ll put your feet when you get up in few hours. Much as we love to joke about our cats throwing up hairballs, hairballs are not funny – to us or our cats. And they’re completely preventable. All you need to do is learn how. 1. Comb your cat often with a flea or greyhound comb. Then wipe him down with a soft cloth to gather up any remaining loose hair. The less loose hair he has to ingest, the less likely he is to throw up hairballs on your rugs. 2. Add wet food to his diet to keep his skin hydrated and in top condition, minimizing the shedding that causes hairballs. Even better, transition him to an all-wet-food diet. 3. Add wild salmon or fish oil to his diet, also to help prevent dry skin and shedding. 4. Plant a big pot of cat grass for him to munch on. The grass will add some fiber to help pass hairballs through his intestines. It will also keep him away from your plants, which can make cats throw up, too. Canned or baby food pumpkin is another good source of fiber, and most cats love it. 5. Keep him active. Physical activity promotes a healthy coat and skin, so there’s less shedding and less loose hair to ingest. 6. Keep him well hydrated, too. Drinking enough water or the moisture from wet food will help him pass loose hair he ingests quickly, before it can form clumps. 7. Put a dab of Vaseline on your cat’s paw once a week. It will lubricate his digestive tract so ingested hair passes through instead of coming back up. You can also use a bit of butter or margarine. 8. Hairball treats and gels can work for many cats, but be sure to give them about two hours before or after a meal. Because they act as laxatives, they can interfere with the absorption of the cat’s food. 9. Hairball control food usually contains powdered cellulose and other inferior ingredients that don’t provide adequate nutrition for a cat. I wouldn’t recommend any of these products. If your attempts to prevent hairballs fail, these home remedies work. – Pumpkin can be a cure as well as a preventative. Use canned pumpkin (not the pie filling!) or baby food. Most cats like it and will eat it off a spoon. Or add it to your cat’s wet food. – Slippery elm bark coats the digestive tract, allowing the hair to pass through easily. – Egg yoke lecithin dissolves the fat that holds the hair together in clumps. Add it to your cat’s wet food. – Cat grass is another preventative than can also be a cure for hairballs. Grow it in a big pot, so it doesn’t topple over when your cat’s eating. Despite what you may have heard. 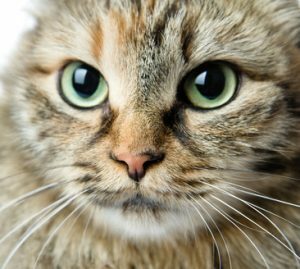 It’s not “normal” for a cat to throw up often. If you’ve ruled out hairballs, here are some other causes to consider. — A swallowed string, tumor or severe constipation can all cause frequent vomiting and require immediate medical care. Even hairballs can cause an impaction so serious the cat needs surgery. – A cat throwing up undigested food is often a sign that he’s eating too fast. Free feeding wet food or offering your cat several small meals a day will keep him from getting so hungry he gulps down his food and vomits it back up. Raising his dish off the floor so he doesn’t have to bend down so far to eat can help, too. – A sudden change in diet causes many cats to throw up. If you change your cat’s diet, you can avoid stomach upset by making the change gradually over several days. – Food sensitivities often cause frequent vomiting, diarrhea or both in cats. Even one ingredient in a cat’s food can be enough to cause stomach upset. Ingredients most likely to cause a food sensitivity are corn, soy, wheat gluten, artificial colorings and preservatives, fish and beef. Since food sensitivities develop over time, it’s a good idea to feed a variety of brands with a variety of ingredients. That could prevent your cat from becoming sensitive to one particular kind of food. – Some chronic diseases cause frequent vomiting. Among them: bladder stones and crystals, hyperthyroidism, diabetes, kidney disease, irritable bowel disease, lymphoma, pancreatitis and liver disease. If your cat’s throwing up often, it would be a good idea to for him to see the vet. – Some medications – especially antibiotics and methimazole, the drug most often used to treat hyperthyroid cats – can cause stomach upset. Probiotics or even a spoonful of plain yogurt can help with the vomiting. Or ask your vet for medication for nausea. If your hyperthyroid cat’s methimazole is making him sick, ask your vet for the transdermal gel you’d rub inside an ear flap. That’s less likely to cause side effects. –Many plants, antifreeze, some household cleaners and air fresheners can all be toxic to cats and can cause vomiting. If you suspect your cat is throwing up because he ate a toxic plant and you don’t know the name of the plant, take a leaf with you when you go to the vet so it can be identified. – Intestinal worms and heart worm disease can also cause vomiting. Different parasites respond to different treatments, so talk to your vet before trying to deworm the cat yourself.